Live performance and DJ sets by Bonaventure, Kuedo, Safa, M.E.S.H. and Nkisi. Programmed in conjunction with Metahaven: VERSION HISTORY, Metahaven and the ICA present a night of live performance and DJ sets by electronic musicians and producers Bonaventure, Kuedo, Safa, M.E.S.H. and Nkisi. A Plot Formerly Known as Dream celebrates the work of three musicians who have collaborated with Metahaven, and two whom Metahaven greatly admire. These artists’ layered compositions fuse complex influences and forms of sonic collage to conjure moods, identities and rhythms that are at once cinematic, expressive and interrogative of lived realities. 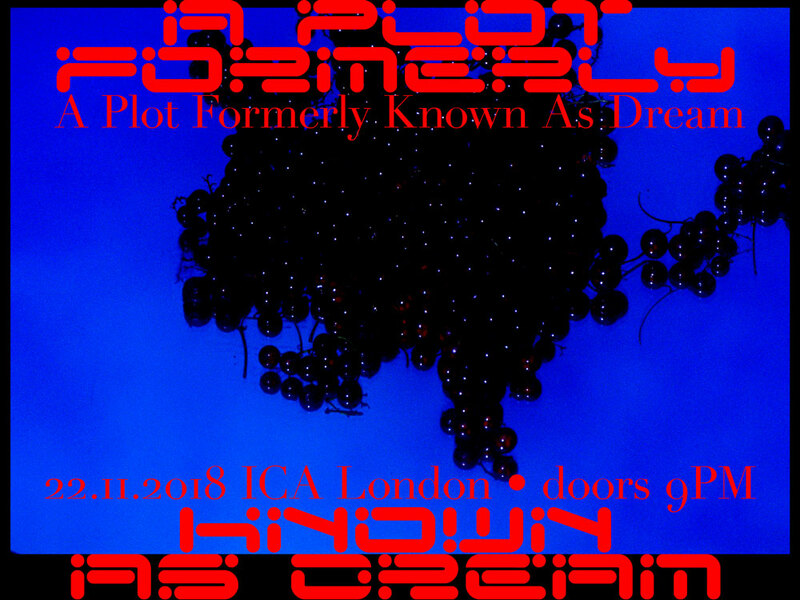 For A Plot Formerly Known as Dream, Metahaven have designed a limited-edition T-shirt available only at the ICA, for sale on the night. Bonaventure (Soraya Lutangu) uses music as a tool to connect her African and European influences, and to investigate the boundaries of human relationships. Her compositions range from hard club tracks to supple synth atmospheres. Her debut EP Free Lutangu features collaborations with Coucou Chloé, Endgame and Ziúr, and Bonaventure performed Anxietina, her collaboration with artist Hannah Black, at the ICA in 2016. Bonaventure’s second EP Mentor is released in November 2018. Kuedo is the artist project of Jamie Teasdale, a composer and sound designer based in Berlin. Kuedo releases on Planet Mu, Hyberdub and Knives, and collaborates with a wide range of artists, including Flying Lotus, DJ Shadow and Roly Porter, among many others. His recent synth album Slow Knife weaved rhythm and bass, atmosphere and drone, and noise and melody. Kuedo scored Metahaven’s most recent work Eurasia (Questions on Happiness), as well as their earlier film The Sprawl (Propaganda About Propaganda). Safa (Mhamad Safa) is a Beirut-based architect, composer and sound artist. His work centres on the politics of sound within both institutionalised and militarised environments. Besides his musical and architectural practice, Mhamad has composed music for numerous films for artists, such as Metahaven, Bahar Noorizadeh and Panos Aprahamian, among others. As a co-resident of Berlin club night Janus, DJ and producer M.E.S.H. has been active in bringing fragmented rhythms to the dancefloor on PAN EPs such as Scythians and Damaged Merc, and building oblique, theatrical sound-stages on longer works such as Piteous Gate. Cinematic effects enshroud ornate, virtual-acoustic instrumentation in his work and latest album Hesaitix. M.E.S.H. scored Metahaven’s Information Skies (2016).